A unique product for students as well as travelers. 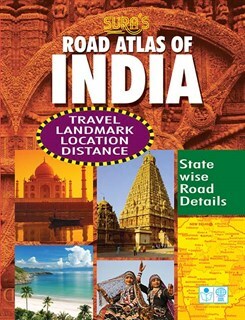 Indian Political, Indian NH Text, Indian National Highway, Indian India Railway, Indian Air Route, Route Map of Chennai, Route Map of Mumbai, Route Map of Delhi, Route Map of Kolkata, The book imparts comprehensive information about India – its culture, landforms, history, tourist attractions, states and cities of the nation. High quality colourful maps, pictures of places of tourist interest, geographical facts; distance chart supported with simple text in one pact is extremely useful.